U.S. Sen. Ted Cruz, R-Texas, and his Democratic rival, U.S. Rep. Beto O'Rourke of El Paso, made their closing arguments Saturday as they embarked on their last weekend of campaigning in the hotly contested race. CORPUS CHRISTI — U.S. Sen. Ted Cruz, R-Texas, and his Democratic opponent, U.S. Rep. Beto O’Rourke of El Paso, embarked Saturday on their final weekend of campaigning in the nationally watched race, pressing their closing arguments and assuring supporters victory was within sight. Addressing supporters packed into a Dallas record store — and spilling onto the street outside — O'Rourke implored them to do everything possible to get out the vote between now and Election Day, suggesting they take off work Monday or skip classes. Check out your personalized election results. "I promise you can make it up later," the El Paso congressman said. "We may never get this chance — this opportunity — back." Hundreds of miles apart, Cruz and O’Rourke traversed the state Saturday as final numbers came in from the two-week early voting period, which ended Friday. In the 30 counties where most registered voters live, 4.9 million Texans voted early, blowing past the tally for the last midterm elections in 2014 and topping it for the 2012 presidential election. With polls showing a tightening race, both sides continued to exude confidence that high turnout would work in their favor come Tuesday. Cruz resumed a statewide bus tour Saturday with a stump speech reworked to emphasize three issues that he said are on the ballot Tuesday: jobs, freedom and security — a trio that has long been part of his political repertoire. His revamped remarks also appeared to put a bigger exclamation point on what he said were the GOP's "incredible victories that we have won over the last two years — and we’re just getting started." “With this record prosperity we’re seeing, who would want to screw that up?" Cruz told a boisterous crowd of roughly 500 during a nighttime rally in Corpus Christi. "Because my opponent in this race, Beto O’Rourke, opposes everything I just said." As Cruz hailed the progress made during President Donald Trump's administration at stops in Victoria and Corpus Christi, O'Rourke was out personally knocking doors throughout North Texas. His campaign says it has knocked on over 1 million doors since its get-out-the-vote program began Oct. 5, and it has set the ambitious goal of hitting another million before Election Day. Rallying supporters Friday night on a conference call, O'Rourke likened the rigorous final push to the work ethic that fueled his 2012 upset defeat of then-U.S. Rep. Silvestre Reyes, D-El Paso. "Of the two campaigns in this race, we’re the only one that has a ground game like this," O'Rourke said on the call. "We have distinguished ourselves so far by our hard work, by our positivity ... please keep that going over the next four days and I promise you we’ll win this Tuesday night." Cruz began Saturday in Houston, where he appeared at a “Women for Cruz” event with his wife, Heidi; Texas first lady Cecilia Abbott; and his mom, Eleanor Darragh — making a rare appearance on the campaign trail. Leading a discussion that he billed as an atypical campaign event and a “celebration of women,” Cruz showed a looser, gentler side as he and his wife needled one another, and he largely kept the spotlight on the achievements of the three women. But the mood turned serious when Cruz posed a question to each of them: As moms, why does this election matter? Supporters of both candidates acknowledged high stakes with a few days left — and polls showing Cruz with anything but a comfortable lead. After Cruz's afternoon rally in Victoria, Chuck Wiegand, a 62-year-old who works in the construction industry, said he hopes the senator wins by a convincing margin that sends a clear message to Democrats. "I don’t want to see a squeaker," Wiegand said. "I want to see a landslide — to get the point across about what this country really means." Reflecting on the home stretch in Dallas, O'Rourke backer B.E. Smith praised the candidate as giving voice to Texans who feel they have not been represented. "He speaks for those people that have been here legally and have made Texas our home and work every single day, and we still feel like foreigners," said Smith, a librarian who immigrated to the United States from Mexico. "He's really trying to make Texas a better place." Cruz and O’Rourke are barnstorming the state through Election Eve. Cruz is scheduled to be in North Texas on Sunday and Harris County on Monday, while O’Rourke has stops slated over the next two days in Austin, San Antonio, Houston and Dallas. 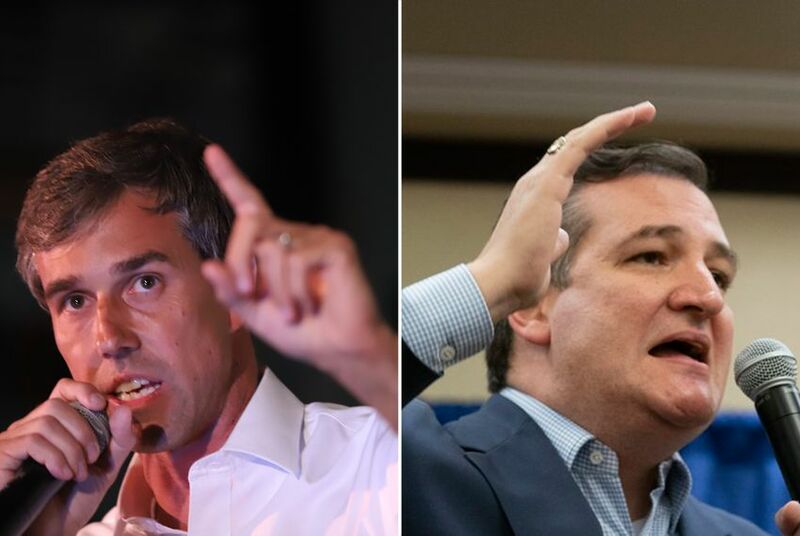 Both candidates plan to spend Election Night in their hometowns — Houston for Cruz and El Paso for O’Rourke. Ted Cruz and Beto O’Rourke entered Congress at the same time. Here’s what they have accomplished.